On Arbor Day, the City of Wilsonville and Oregon Travel Information Council are hosting a celebration to dedicate two trees along the Willamette River that – quite literally – bear the scars of the role they played in facilitating the success of Oregon’s logging industry. From the mid-1800s until the 1980s, log rafts were floated down the Willamette River by tugboats, with “cable trees” on the river’s edge used to tie-down log rafts until the logs were to be delivered to the mill. 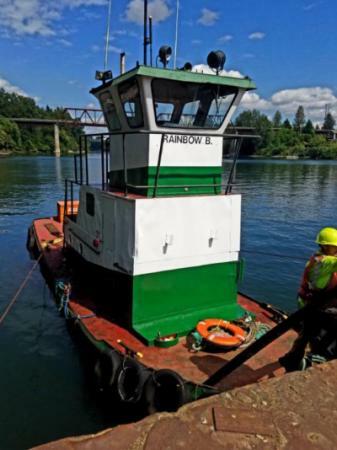 Learn about the City’s logging and maritime history, visit the two heritage trees and see a few tools of the trade, including a retired tugboat that operated on the Willamette River towing log rafts to local mills. We've achieved state heritage area status. But gaining national recognition from Congress and the National Park Service requires hard work, persistence and a constant outreach and contact. That takes resources in time and money. Your gift counts! Please donate to help us continue our efforts.